You know Krista Watterworth as the interior designer host of Splurge and Save and Save My Bath on HGTV, but did you know she also appeared on All My Children and As the World Turns? You studied acting at the Actors Studio and later went to Parsons to study interior design. What made you take the leap from one pursuit to the other? I really wanted to be an actor. I actually got a manager and an agent while I was at the Actors Studio, which gave me a little bit of a jumpstart. I wanted to be a series regular or a soap opera actor–I liked the stability of going to the same place every day. I auditioned for the pilots of Grey’s Anatomy and Dexter and was seeing some pretty major casting directors at NBC, CBS, Showtime, and HBO. While I was in the process of trying to get that big gig, I met an agent who said, “Listen, why don’t you try doing some hosting?” So I auditioned for E! and things like that, but my first audition was for HGTV’s Save My Bath and I got it. The rest is history! 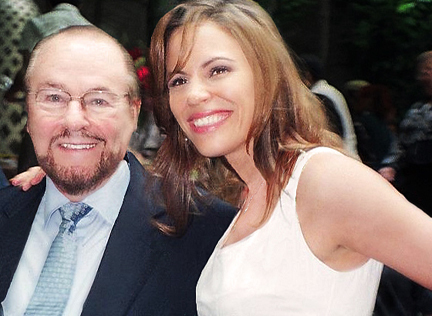 Krista often sought out career advice from James Lipton, Dean of the Actors Studio. You became an HGTV host before you went to Parsons for interior design? I did. They were looking for personalities back then. That was back in 2005-2006, when they were much more formulaic. But don’t think I didn’t have design experience, because it was a love and passion of mine. I started doing elevations of homes when I was seven years old. I would do dissections of homes and draw people in the rooms, watching TV, doing their homework, having dinner. As an adult, I dabbled in design, staging my friends’ and family’s homes for sale and designing their apartments in the city. I started a business with a friend of mine who was a really well-known prop stylist. We were going to stage high-end apartments in Manhattan. Do you still have acting ambitions? Girl, I can barely brush my teeth in the morning! I have no time. My design business is doing really well. I just shot the third season of The Vanilla Ice Project for the DIY Network, I’ve been working on Restaurant Impossible on the Food Network. Once I started having babies, life changed, responsibilities changed and priorities changed. Women can do it, but I can’t leave my kids for weeks at a time to go shoot a show. That’s why Restaurant Impossible was so great, because you’re leaving for three days. I don’t want to be an absentee mom, so location shooting is just too hard for me. When I was pregnant with my second baby, they wanted me to audition for a show called Lose or Improve, which moved to Canada and is now called Love It or List It. I didn’t want to move to LA so I passed on that. You have to be willing and you have to have something in you that wants to be a huge star and I just didn’t really have that kind of ambition once I started having kids. Before I had them, I would have moved to Borneo if they wanted me to! Krista and husband Eric Alterman, with kiddos Skylar and Griffon. How is designing for television different from designing for your private clients? Do you make different choices? I honestly design through a camera lens. I see rooms through camera angles. In television, you design for that pan across the room, so there are certain things you focus on. You also think a little bit bigger. Light fixtures are bigger, a little more dramatic. I try to use larger patterns versus smaller patterns, and I like geometric, graphic prints with contrast, because a lot gets lost on camera. When I can design almost like a set, it propels me and inspires me. I try to help people take things that they love and use them in the design in a modern way, if at all possible. In one episode of my show Splurge & Save, I got a ton of photographs from this couple who traveled a lot and had two small children—that’s always the cute time, when kids are small. I had a wallpaper mural created using really cool, candid photographs from their travels and of their kids. When my client saw it, she just started crying. When you’re working in television, you definitely want clients to have a deep emotional connection for the camera, but you also get so much personal and professional gratification out of it because your work brought that emotion out in someone. That’s definitely a motivation for me. There’s a common perception among television viewers that a designer on TV doesn’t have time for their project or may be too expensive for their budget. Do you find your television work to be a barrier to potential clients? Does that make you intimidating to them or does that just bring you a different type of client? I haven’t been doing a lot of TV lately for a reason. I had an offer to do several more episodes of Restaurant Impossible and I had to turn it down because it gets in the way with my regular design clientele, and that’s where the real money is. There’s not a lot of money in design television unless you’re the star or the producer of the show. Being on TV has brought me younger clients. I read that you and your husband moved into what used to be your in-law’s vacation home and did a gut renovation on it. Many people get attached to their homes and their décor—how did you navigate the waters in making that the perfect house for you and your family without stepping on your in-laws’ toes? My father-in-law loves architecture so I got him involved. As a result of working together, it made it easier because he contributed to the work. We’ve since sold the condo for a ridiculous amount of money even though we sold at the low end of the market. It was amazing that our renovations made such a difference. After that, he hired me to do a guest suite in his house and just trusted me and let me do it. “Just have fun,” he said, and there was no budget. It’s great working with men and it’s great working with no budget! Krista’s bright and cozy home. They mention on The Vanilla Ice Project that you get a $7,000 budget to stage the multi-million dollar homes he renovates and you don’t get much money to work with on Restaurant Impossible either. If the old adage, “you can either spend time or you can spend money” is true, how do you make those transformations happen when you don’t have a lot of time or money? For The Vanilla Ice Project, a furniture company sponsor the show each season and they provide product, or Rob will kick in if we’re a little over budget. As for Restaurant Impossible, sticking to a $2,000 budget is ridiculous—you could spend that in flooring alone. If you have time to think about it, you can really get creative. There’s Craigslist, there’s eBay, there are local mom-and-pop shops who are willing to give you good prices because you’re shooting in their town. With these restaurants, there are a lot of connections and hometown flavor. People love each other—they have a personal connection to these restaurant owners and they want to help. So you’ll get deep discounts on tile and paint and all that stuff. On the set of The Vanilla Ice Project, with rapper-turned-contractor, Vanilla Ice. I was moved by what I read on your website about how you moved around a lot as a child and always wanted a room you could come back to that was familiar, so you wanted to create that for your kids. Do you think that ever carries over to your client work? Do you project that sentimentality into your clients’ homes? Definitely. I ask a lot of personal questions when I’m designing for people. I like incorporating personal photography into the artwork in a space. If there are any special pieces that they love, I try really hard to incorporate them into the home. I’m working for a client right now who has a piano from the 1920s—it’s not that pretty. I could try to sell her on putting it somewhere other than the main room because I’m having to design an entire room around this odd-looking piano, but it means so much to her. It’s the only thing she wants to keep. She has a nice budget and a very large home but the piano is more important than anything else, so I wouldn’t dream of asking her to stash it somewhere out of view. 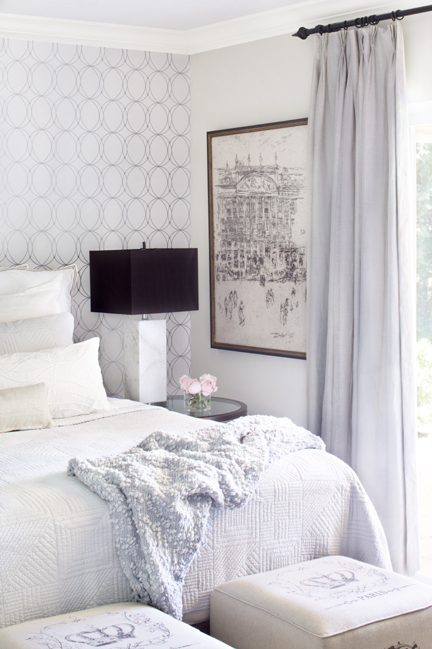 Krista designed this glam bedroom for a client to reflect both masculinity and feminine charm. I see that you’re involved with a charity that was founded in your mom’s name. What kind of work does the Iona Watterworth Comfort Fund do? My mom is an angel on Earth. Nurses are unsung heroes—the doctors always get all the credit. She’s dedicated her life to hospice care and people with terminal illnesses. She helped take care of them in their homes and she was given this charity so she could supplement the people who don’t have enough money to purchase certain things for their medical needs. The money goes directly to the patients from her fund so that makes it amazing—you can actually see the changes in people’s lives. I want to start my own charity designing rooms for people with special needs and kids who are dealing with illness. That’s my dream—I’d really like to do that. Between television appearances, Krista Watterworth runs a successful interior design practice serving clients in New York City and Palm Beach, Florida. Photos courtesy of Krista Watterworth.